Roger McNamee T’82 has climbed to the top of the tech world. Roger McNamee T’82 walks onto the stage in jeans and a hooded purple sweatshirt. The theater is packed and dimly lit. The audience is a sea of expectant eyes. McNamee is used to being on stage—he is a guitarist for the prolific rock band Moonalice—but today, a calm, mostly overcast day in June 2011, he is on stage for a different reason. Today, he is the hyper-successful Silicon Valley investor, and he is about to let the audience in on a secret—or maybe a few. McNamee may not look like a stereotypical finance guy. His shoulder-length gray hair flops as he speaks. His flyaway eyebrows rise and fall with enthusiasm. From behind round wire-rim glasses that make him look like an eccentric savant, he gazes intensely at the audience. McNamee has always been different, but that doesn’t bother him. After all, it is his ability to think differently that has gained him the sort of success that landed him here, at the inaugural TEDx Santa Cruz conference. “Have you ever been in the position of watching Silicon Valley take off and wish that you had known what was about to happen?” he says slowly, emphatically. The audience chuckles. Over the last few years, McNamee has noticed a shift, so he devised several hypotheses about the tech market and ran them by an inordinate number of people in the industry to see if anyone could refine them. This is what McNamee does best: He is a tireless observer and a brilliant analyst, but he is also unfailingly open-minded and a steadfast believer in open-source ideas. Roger McNamee is the first to tell you he has been wrong, both often and spectacularly, such as with his attempt to dislodge the iPhone with the Palm Pre in 2009. But he has also been profoundly prescient, and he very well could be right again. At the end of the talk, the audience claps and hoots and even stands on their feet. Perhaps they think his ideas are spot on or they recognize the courage it takes to stand in front of an audience. Maybe they can simply sense that there’s something different, something valuable, in the worldview of the quirky investor loping off the stage. Or maybe they are just being polite. Roger McNamee considers himself very lucky. Over the past three decades, he has worked at T. Rowe Price, the large mutual fund manager, and three investment firms that he cofounded, building an astonishingly successful track record as the tech industry grew up. Along the way, he gained a reputation for being a gifted strategist, seemingly able to see around corners and predict the future. And he has befriended and advised some of the greatest luminaries of the tech world—Bill Gates and Mark Zuckerberg are examples—as they’ve made their names. Now, McNamee enjoys a high profile as the co-founder, with rock star Bono and others, of Elevation Partners, a web and media private-equity firm that is wrapping up its successful $1.6-billion fund. But he considers himself lucky for even deeper reasons. McNamee has always been an unfailing optimist, a dogged social liberal, a self-described nerd, and a hippie at heart. Now, in his late 50s, his success allows him to not only indulge his myriad interests—music, baseball, conservation—it affords him the opportunity, through new philanthropic endeavors, to make at least some small part of the world a better place. Roger McNamee hasn’t always been lucky. Growing up in Albany, N.Y., McNamee was the second youngest in a family of eight children and didn’t receive a lot of prodding or guidance from his mom, a retired journalist among many other roles; or his dad, a lawyer and the founder of First Albany Corporation, a regional brokerage business. As a child, McNamee was afflicted with an extreme variant of celiac disease and, while other kids were eating cake and cookies, had to quickly learn the art of self-control at a very young age. At age 10, he suffered a near-fatal accident while at summer camp, underwent emergency surgery all alone, and endured a long, lonely convalescence period. In his late teens, McNamee headed off to Yale but dropped out after his second year to follow a girlfriend to California. His parents were unhappy with the choice, so he cut ties with them, becoming financially independent at the age of 20. “That experience was the beginning of me figuring it out,” he says. “Having to support myself with no safety net wound up being enormously helpful.” About a year later, his father died, knowing only that his son Roger was a college dropout with a strong-willed girlfriend. Eventually, McNamee realized that the girlfriend was a bad match and he reapplied to college, where he studied history. He also met his future wife, Ann, who was then a young doctoral candidate in music theory and fellow nerd with a voracious curiosity. When McNamee graduated from college, he knew exactly what he wanted to do: play music. But he also craved financial security, so in 1980, he arrived at Tuck, which would set his life on a new path. “Without Tuck, there is no chance that I would have gotten into investing, let alone be successful at it. There’s just no way to overstate the significance of Tuck for me,” says McNamee, who along with Ed Glassmeyer T’68, provided the initial funding for Tuck’s Glassmeyer/McNamee Center for Digital Strategies in 2001. McNamee’s career is a tribute to good luck and good timing. Two weeks after McNamee sent his resume to T. Rowe Price in 1982, the technology team there departed. At the time, the company was the largest investor in emerging growth companies and was heavily involved in technology. They needed a tech team—quickly. Amid their stack of cold-call letters was McNamee’s. They were initially reluctant to hire him, but McNamee talked his way into a job offer. He started his career on the first day of the bull market of 1982. McNamee felt he was behind his peers and worked doggedly to catch up. He knew only the most rudimentary things about technology, but he was enthusiastic and worked really hard. In retrospect, McNamee recognizes that technology was possibly the only sector of investing dynamic enough to allow his idiosyncratic approach to succeed. Besides luck, McNamee attributes his success to a great marriage and a really long commute. T. Rowe Price was in Baltimore, but McNamee’s home was outside Philadelphia, where Ann was a professor at Swarthmore College. Realizing he had the flexibility to work longer hours and travel much more than his peers, McNamee “made lemonade from the lemons” of a crazy commute. “The great insight I had was that in technology, the threat never came from big companies, it always came from startups, which you could only learn about by hanging out in Silicon Valley,” he says. And as giants like IBM declined, hundreds of players vied to fill the void. McNamee used his time to visit companies and learn the business from the people who were doing it. For example, during calendar year 1990, he had 400 face-to-face meetings with tech companies—at a time when top ranked analysts typically did fewer than 40. This eventually led not only to a deep understanding of the zeitgeist of the tech industry but also to an inspiration. That’s when he decided to start a new kind of fund that invested in late-stage private, as well as and public, companies. T. Rowe Price thought it was a good idea but eventually passed, so in 1991, he and a colleague, John Powell, left amicably and partnered with the venture firm Kleiner Perkins Caufield & Byers to establish Integral Capital Partners, the first crossover fund. Kleiner Perkins was in Palo Alto, Calif., to which McNamee commuted nearly every week for 10 years. Just before Integral Capital Partners started, another stroke of luck arrived: the tech bull market began. Over the ensuing decade, McNamee was able to watch—and participate—from the offices of Kleiner Perkins, ground zero for the World Wide Web. He remembers when Marc Andreessen walked into the office with the original Netscape idea, Jeff Bezos with Amazon.com, and eventually Martha Stewart with her lifestyle company. By 1997, things were getting crazy, and McNamee realized that if Martha Stewart could get a billion-dollar valuation just by adding the Kleiner Perkins name, then a crash was inevitable. Investors like him would get crushed. So McNamee spent two years figuring out how to protect his investors from the inevitable collapse. With underwriting from Morgan Stanley, he founded Silver Lake Partners, the first tech-focused private-equity fund, with three colleagues. It was designed to buy companies, such as Seagate, the world’s largest disk drive manufacturer, the online brokerage house Datek (now Ameritrade), and Gartner Group, a consulting firm; build them; and grow them during a bear market. For their first fund, Silver Lake raised $2.4 billion in 1999. At the same time, Integral cashed out its core fund and returned the money to investors in March 2000, right before the market tanked. Countless people have asked McNamee for his advice and have tried to parse what about him is the key to his prodigious success. He is charismatic and outspoken and, in many ways, enigmatic. He’s also intensely loyal and holds not only very high standards for himself but also for others. As a result, he is not the easiest person to work with. His ability to observe patterns and to analyze very deeply contribute to his success, but there are two things that are even more elemental: curiosity and an earnest desire to be involved in some good in the world. McNamee’s life, like most, is marked by strokes of good luck and strokes of bad luck. In 2001, a birth defect in his heart caused two strokes, and McNamee underwent open-heart surgery. As he recovered, stress mounted as his partners at Silver Lake edged him out of the company he founded, even though he had the opportunity from Steve Jobs to buy an 18 percent stake in Apple when it was trading for cash. The stress from surgery and the heartbreak of losing the company, however, motivated McNamee to make some big changes. He changed his diet, exercised more, and systematically minimized stress. With U2’s Bono and former Apple CFO Fred Anderson as his partners, he then started Elevation Partners. McNamee now has the freedom to indulge his many interests and, without kids or a golf habit, plenty of time to follow them to all sorts of unusual places, often at the expense of his own time or money. After Jerry Garcia’s death, for example, he helped the Grateful Dead, one of his favorite bands, stay afloat through direct sales to fans. Observing the post-bubble depression in Silicon Valley during his recovery from heart surgery, he wrote a book, “The New Normal: Great Opportunities in a Time of Great Risk.” The book was an attempt to help people make the most of the disruptions in our economy. Because he believed for-profit media companies were no longer practicing good journalism, in 2004 he volunteered at Wikipedia and National Geographic to help them improve the distribution of facts and hard science. He helped raise more than $8 million to start the Wikimedia Foundation that enabled Wikipedia to be financially secure, while helping National Geographic use technology to improve access to the sciences and discovery. Nowadays, two philanthropic passions dominate his time. McNamee has always loved poster art. In their younger, leaner years, posters were among the few possessions he and Ann carted around. When Moonalice started, the band decided to commission a poster for every show, and now, they have over 750 original works of art. He is also a stalwart champion of the underdog, and poster artists, who contributed so much to the music scene of the ‘60s and ‘70s, were chronically underpaid and exploited. Now, he and Ann are currently funding the Haight Street Art Center. The 12,000-square-foot space, located in a historic 1930s University of California Extension building in San Francisco, will be completed in early 2015. It will be run as a co-op, and the artists will have access to a fine art print shop as well as exhibition space. Another project McNamee has in the works is the Tembo Preserve, a 5,000-acre protected area for African elephants in northern California’s Tehama County. The goal is build a herd of elephants from scratch over the next 100 years, enabling them to live a “near wild” life in a climate comparable to southern Africa. In partnership with the Oakland Zoo and several elephant conservation groups, the preserve—which the McNamees hope will be approved by government agencies and built in the next three to five years—will house elephants from zoos and run studies and test technology to aid in their conservation. “Zoos are for the benefit of humans; Tembo will be optimized for the elephants who live there,” says McNamee. But perhaps the area of his life that McNamee enjoys the most is still music. With Moonalice, he travels all over the country, playing up to 100 shows a year. The band’s single, “It’s 4:20 Somewhere,” has been downloaded more than 4.6 million times. McNamee also uses the group as a laboratory for tech ideas; Moonalice invented the idea of the Twittercast concert and the use of a satellite-based broadcast system that allows fans to tune into live concerts for free. These suggest an essential truth, not only about the band, but about McNamee: he believes deeply in the importance of personal creativity as well as democratizing access to ideas and information. 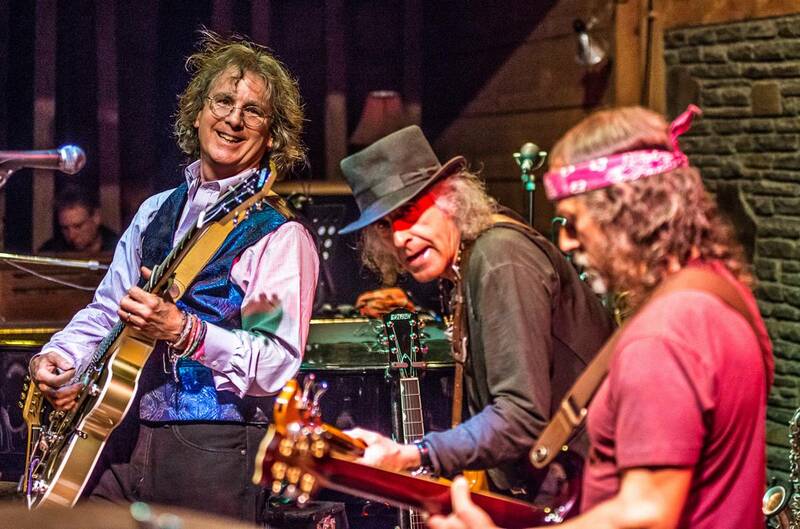 On a Sunday evening this past September, at the Sweetwater Music Hall in Mill Valley, Calif., the men of Moonalice take the stage. The theater lights are low, and the audience mills about. Tonight, McNamee wears his signature purple T-shirt, a button-down, and a salmon vest. This, right here, is what he has always known he wanted to be involved in: the transformative power of music. “There’s almost no greater joy,” he has said, than creating, recording, performing, and distributing music. This is plain to see as he strums his guitar, bobs his head to the beat, and closes his eyes, singing a ’60s-inspired rock version of “It’s a Wonderful World.” The band backs him up and the audience listens intently. Roger McNamee is in his element.